If your workbench is anything like mine it's covered in cables of one sort or another. 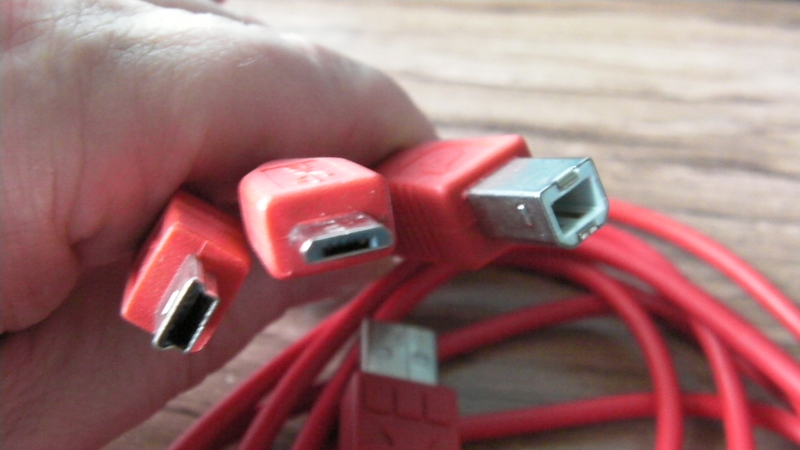 Anything that helps manage that tangled complexity is a good thing, so I was very interested when I saw the "cerberus" multi-headed USB cable available from Sparkfun and distributors. As I hope you can see from the picture, it has a standard USB "A" plug on one end, and the three most common options on the other ("B" plug, mini-USB, and micro-USB). Conveniently these are the three plugs used for power and/or data by the three main development boards I use: Raspberry Pi uses micro-USB for power, Freescale Freedom boards have a mini-USB socket for power and programming, and Arduino Uno expects a USB type B. There's no electronics in this cable, so it's not clever enough to use for data with more than one board, but it does supply 5V USB power to all three ends, so with a decent 5V supply at the "A" end, it might be able to power multiple boards. I haven't tried this, as all the boards other than the Raspberry Pi have the data pins connected and I'm not convinced that there would be no ill effects from connecting these data pins together. If you really want to do this, then you might consider using a "USB condom" (a fancy name for a USB socket and plug with just the power wires connected). This lead seems useful enough that I have put it into my travel kit, so I can at least be sure of a USB cable to power whatever I am working on.